« From $229,900! PARC EAST Port Coquitlam Condos is Tri-Cities BEST Condo Value! NOW SELLING! 1 – 3 Bedroom Homes Live Oakridge Langara District! 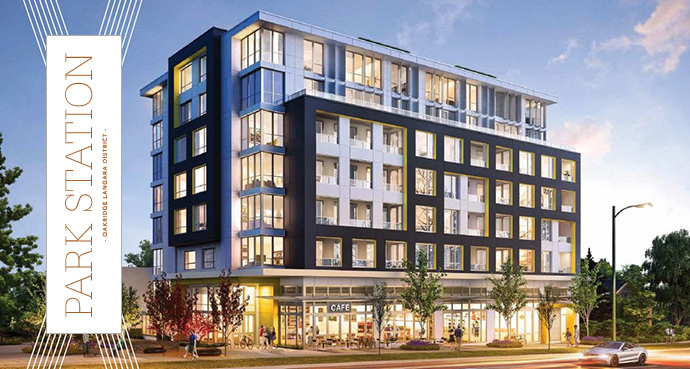 A boutique 8 storey mid-rise building in the heart of the Vancouver West Side is now launching at Park Station Vancouver where you will find a limited number of exclusive residences in this central and well established neighbourhood. 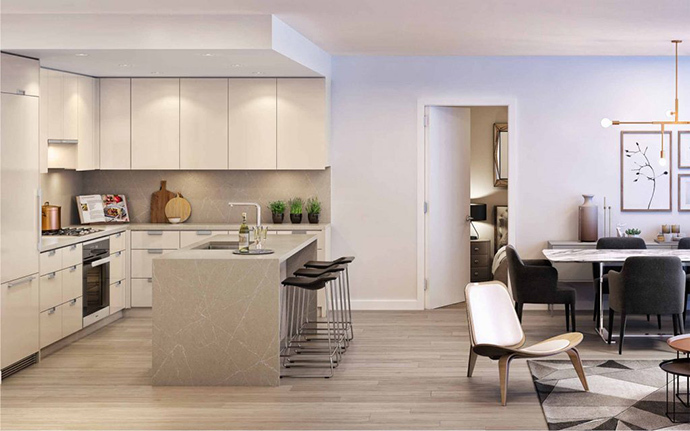 Offering 55 condominium homes for sale, the West Side Vancouver Park Station condos will range between one to three bedroom layouts and will feature airy 9 foot 4 inch ceiling heights, air conditioning in every residence and integrated Miele kitchen appliances. In addition, residents at the presale Vancouver Park Station condos have access to a 564 square foot indoor amenity space plus an outdoor amenity area with seating. The interior courtyard will also have outdoor dining space and a children’s play area. The Park Station Townhomes have private, ground level patios and the four penthouse suites will have a private rooftop patio. There is secured underground parking, visitor parking, storage lockers and bike lockers. 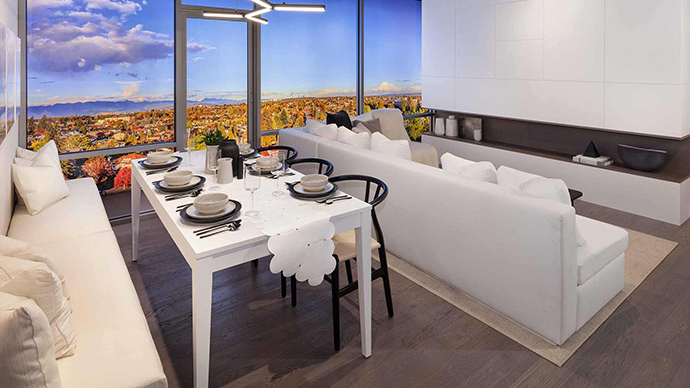 Located in the Oakridge Langara Vancouver West Side district, the Park Station condos are brought to you by L & A Real Estate Investment Group, Integra Architecture, Area3 Interior Design Group and Magnum Project Marketing. Park Station in Oakridge Langara District gives you urban condominium living and a park life. 8 stops along the Canada SkyTrain Line will take you to downtown Vancouver while 6 stops can take you around the world via YVR. The Westside Vancouver Oakridge Langara development features a range of 1 to 3 bedroom floor plans. Please note that they are subject to change at any time. An intimate 8 storey concrete design of 55 homes. From the Park Station Vancouver condo web site: All paths lead to Park Station – a central neighbourhood location in the park-like Oakridge Langara district. A quiet structure in monochromatic tones, Park Station Vancouver exudes confidence and well-grounded permanence. Its timelessness acts as a compliment to its neighbourhood of mature trees and streetscapes, emerging as a captivating new addition to the boulevard. Located next to Langara 49th Station makes it the perfect jumping off point for an energetic life lived in any direction. Expansive windows and dramatic 9 ft ceilings set the stage for a bold and brightly lived life. Gourmet kitchens, along with thoughtfully appointed baths make living and entertaining pure pleasure. A complete Miele appliance package includes a chef friendly gas cooktop and convection oven, as well as space conscious built-in refrigerator and Panasonic microwave. 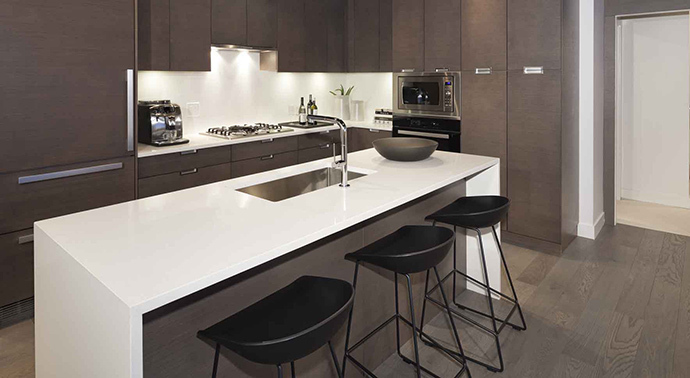 The homes at the West Side Vancouver Park Station condos will also feature beautiful quartz countertops continue in the elegant bath. Acri-tec tub and sink unify the room with a sleek Kalia shower system and Riobel faucet providing touches of clean European design. A walkable life in a lively Oakridge Langara district. Thinking about a movie? Head South to the VIP cinema at Marine Gateway. How about the dim sum in Richmond? Each station along the Canada SkyTrain Line is a new chance for discovery from your home here at the Oakridge Langara Park Station Vanouver condos. Walk a few minutes north to Oakridge Centre, Vancouver’s premium luxury shopping centre. Jump on the Canada Line for a quick lunch in Cambie Village, a quiet walk in Queen Elizabeth Park, or drinks with friends on a patio in Yaletown. All so accessible. In many ways, the Langara/49th Station on the Canada SkyTrain Line is like your own personal metro. Located just next door to your Oakridge Langara Vancouver Park Station home, you’re platform to platform anywhere on the line in no more than 13 minutes. Trains arrive, at peak hours, every three to four minutes, so you can get up and go at a moment’s notice. Look to the west of Park Station condos in Vancouver West Side, you’ll find some of Vancouver’s most prestigious private schools such as Crofton House and St. George’s. The UBC campus is just a 20 minute drive, and on the way, why not do a little shopping at Hill’s of Kerrisdale? To the south, Langara trails make for a fabulous run loop and Langara College boosts a modernist library. Hop on the Canada Line to visit T&T Supermarket at Marine Gateway, McArthur Glen Designer Outlets in Richmond, or for more adventure catch a flight at YVR.